Saturday February 15th 1896 Seth went to town with wood in the morning. Will helped me. Will went in the afternoon and Seth was here to grind the sausage. Just before supper Seth had company come. A young man from home. the boys went down town after supper and Will and I put away the sausage and cleaned up things. Sunday February 16th 1896 I was busy about the house all forenoon. I got early dinner and Will and I went over the river. Will went on over to Woolfs while I stopped at home. Lee I think feels a little better. A very cold day. I read and wrote all the evening. 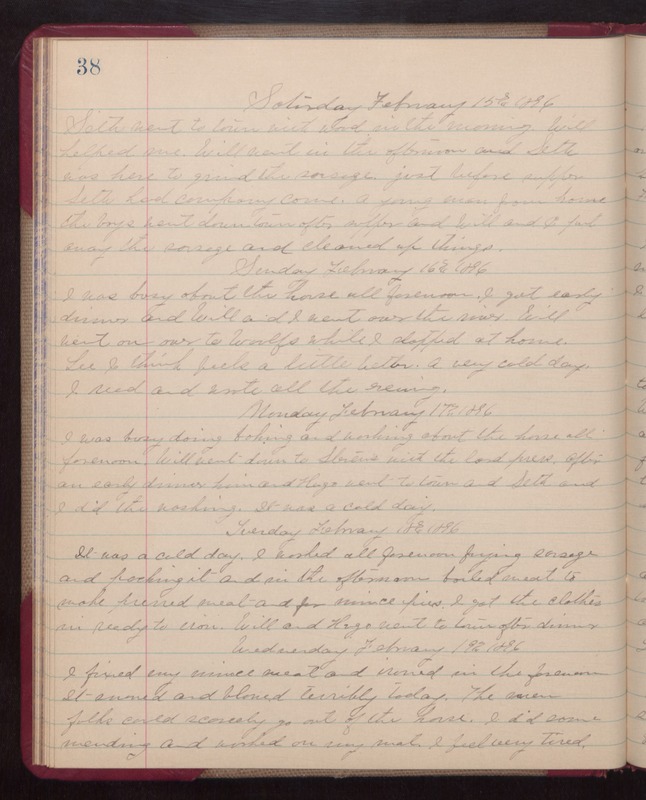 Monday February 17th 1896 I was busy doing baking and working about the house all forenoon. Will went down to Stevens with the lard press. After an early dinner him and Hugo went to town and Seth and I did the washing. It was a cold day. Tuesday February 8th 1896 It was a cold day. I worked all forenoon frying sausage and packing it and in the afternoon boiled meat to make pressed meat and for mince pies. I got the clothes in ready to iron. Will and Hugo went to town after dinner. Wednesday February 19th 1896 I fixed my mince meat and ironed in the forenoon. It snowed and blowed terribly today. The men folks could scarcely go out of the house. I did some mending and worked on my mat. I feel very tired.